The SPX is still all about R2. At the start of this week the intraday high on Monday was 2869.40, so we suspect the hitherto unchanged R2 was still at 2865. However, that day the market closed at 2867.19, which is a fairly blatant sign that either the market had breached R2, or, and more likely, that it had slipped. Today, it is at 2885, and as yesterday’s intraday high was 2885.25, it’s a fair assumption that it was here then. Obviously, it is slipping, and this index just keeps banging on that door until it opens and move back to the next line of resistance. It will probably hold in the morning, but we would be rather more circumspect later on. 2895 is the next R2 line of resistance, but 2905 is where it takes a big step-up. But, don’t forget, next week is the rollover and expiry AND it is a 4-day week. 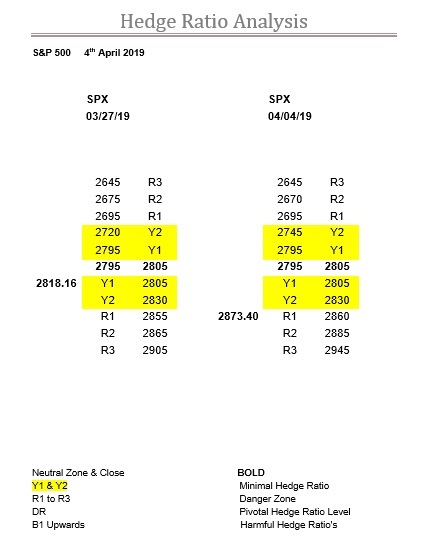 And, more importantly, the zone is still way down at 2795-2805, and is sandwiched in a sea of Y ratio, so if someone says “boo” to this market, there is no support underneath for a very long way indeed. However, as always, best to keep an eye on the DJX as they seem to be the ones happy to force the pace.